20:46 and Public Interest and the Corn Refiners Association. 20:51 floated his soda tax, last February? 20:55 Governor Patterson of New York has since floated one. 20:58 And other people are starting to talk about it. 21:00 So, why are they saying this? 21:03 kids are drinking soda, let's tax it. 21:06 So they're talking about soda like it's empty calories. 21:10 I'm here to tell you that it goes way beyond empty calories. 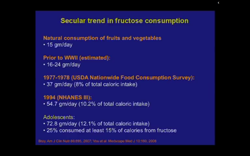 21:17 fructose is a poison, it's not about the calories. 21:22 It has nothing to do with the calories. 21:25 It's a poison by itself, and I'm gonna show you that. 21:30 this paragraph here in yellow. 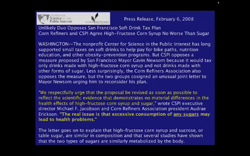 21:40 "of high fructose corn syrup and sugar." 21:44 Here's the important sentence. 21:48 "of any sugars may lead to health problems." 21:51 I agree, that's exactly right. 21:54 Not may, does, does. 22:00 fructose consumption over the past 100 years. 22:11 about 15 grams per day of fructose. 22:16 So sugar would be 30 grams, it'd be double. 22:19 We're just talking about fructose, today. 22:26 we were up to about 16 to 24, about 20 grams. 22:32 of the century to World War II. 22:44 or 8% of total caloric intake. 22:47 By 1994 we were up to 55 grams of the stuff per day. 22:51 Remember, if you wanna do sugar, then double the number. 23:00 is being accounted for by sugar every single year. 23:04 So, it's not just that we're eating more. 23:07 We're eating more sugar. 23:14 12% of total caloric intake. 23:21 at least 15% of their calories from fructose alone. 23:25 This is a disaster, an absolute unmitigated disaster. 23:33 and we're all getting sick. 23:35 Now let me show you why. 23:42 So, this is where the politics comes in. 23:51 to create this perfect storm. 23:59 in this country started with one man. 24:05 And it's still being felt today. 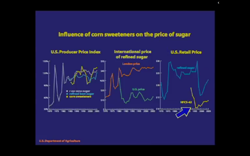 24:13 food prices were going up and down, and up and down. 24:16 I'm gonna show you that on the next slide. 24:19 actually gonna cost him the election. 24:33to make food a non-issue in presidential elections. 24:37Well, the only way to do that was to make food cheap. 24:44to be able to decrease the price of food. 24:46Remember Nixon's war on poverty? 24:49We're suffering from it today. 24:56of high fructose corn syrup. 25:01in Japan, by a guy named Takasaki, who's still alive. 25:13Like everything, it always comes back to haunt you. 25:16And it was introduced to the American Market in 1975. 25:20to the price of sugar when this thing hit the market? 25:29going up and down, and up and down. 25:37at 100%, that's what you want if you're a politician. 25:44entered the market, 1975, 1980. 25:48of sugar has remained remarkably constant. 25:53but also on the international stage. 25:55Here's the London price doing the same thing. 26:07So, in other words, it's cheap. 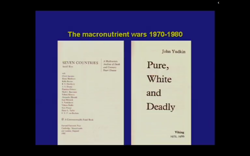 26:09So, high fructose corn syrup is evil. 26:11But it's not evil because it's metabolically evil. 26:14It's evil because it's economically evil. 26:19found it's way into everything. 26:25pretzels, barbecue sauce, and ketchup, almost everything. 26:44have high fructose corn syrup in it. 26:52to all of our food, every processed food. 26:57Well, you'll see why in a minute. 27:02"Well, you know, it's just been a substitution. 27:09"You know, we're just replacing, like gram for gram." 27:1573 pounds of sugar per year. 27:20of the US Department of Agriculture. 27:2373 pounds, up to 95 pounds by 2000. 27:29And there's something missing from this slide. 27:32Anybody wanna tell me what it is? 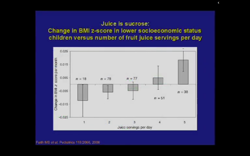 27:38'Cause juice is sucrose, right, sugar. 27:46a prospective study in inner city Harlem toddlers. 27:56in these inner city Harlem toddlers. 28:00Harlem toddlers get their juice? 28:03From what, from where, from whom? 28:12You know what WIC is? 28:15A government entitlement program set up under who? 28:20Nixon, to prevent failure to thrive. 28:27This is the equal and opposite reaction. 28:31So, let's add juice in, here it is. 28:46that we are actually up to 141 pounds of sugar per year. 28:51That's what we're up to. 28:51141 pounds of sugar per year. 28:58have some detrimental effects on you? 29:04Hasn't stopped you, has it? 29:06That's the point, it hasn't stopped you. 29:08That's why we need to talk about this. 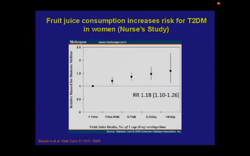 29:13the risk for Type 2 diabetes. 29:17as juice intake goes up, and this is in the Nurse's Study. 29:41all telling us we had to reduce our consumption of fat. 29:46Now, why did they tell us that? 29:54No, we didn't, did we? 29:56In fact, it's worked the exact opposite. 30:01So, now how did this come to be? 30:03Why did they tell us to stop eating fat? 30:13You've heard of that, right? 30:15Is it good or bad? 30:17- Not so bad, we'll talk about it. 30:21dietary fat raised your LDL. 30:27we learned that A lead to B. 30:37that LDL correlated with cardiovascular disease. 30:41So let's call cardiovascular disease C.
30:44So we learned that B lead to C.
30:57"then A must lead to C, therefore, no A, no C."
31:02Now, any logicians in the room? 31:05Anybody see any problems with that logic? 31:13- That's right, the premise is incorrect. 31:15And I'll tell you why the premise is incorrect. 31:17Because this suggests that this is all transitive. 31:21But, in fact, only the contrapositive is transitive. 31:24So, it's not no A, no C, it's no C, no A. 31:28So, the logic isn't even right. 31:32So, this doesn't work on any level. 31:35So, I'm gonna show you why this doesn't work. 31:42a battle royal back in the 1970s. 31:45This was not a simple thing. 31:47There were people lined up on both sides of this story. 31:56and it was called Pure White and Deadly. 32:03by the name of John Yudkin. 32:05Now, I never knew John Yudkin he's passed away. 32:08But, I read this book about a year ago. 32:12And without even knowing it, I was a Yudkin acolyte. 32:16I was a Yudkin disciple. 32:20in 1972 is the God's honest truth. 32:25And if you wanna read a true prophecy, you find this book. 32:29It's not easy to find, but you go find this book. 32:34this guy said has come to pass. 32:36It's astounding, I am in awe of this guy. 32:40But on the other side we had this guy over here. 32:43His name was Ancel Keys. 32:51very interested in the cause of cardiovascular disease. 33:00Now, anybody know what that means? 33:19to an outcome that you're looking for. 33:21So, he was interested in cardiovascular disease. 33:28called the Seven Countries Study. 33:31Very famous, front page of Time Magazine in 1980. 33:36So, here's the data on the Seven Country Study. 33:42England and Wales, Italy, Japan. 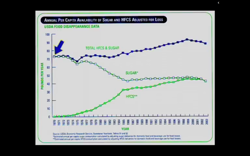 33:48and here we have coronary disease death rate on the y axis. 33:51And so you'd say, "Oh, look at that." 33:53I mean, it's very obvious, isn't it. 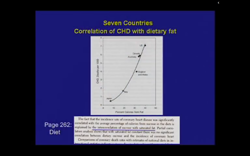 33:57correlates very nicely with coronary disease, right? 34:00Except for one little problem. 34:08So, how much sugar do they eat? 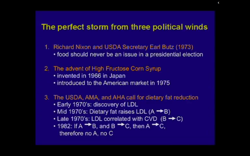 34:10Didn't I tell you the Japanese diet eliminates fructose? 34:14we brought it to them after World War II. 34:17Italy, aside from gelato, I mean what else they got? 34:24there's a lot of glucose, but no fructose. 34:29other than the occasional sweet, which they moderate. 34:32They're very careful about moderating, and they cost a lot. 34:38you know, we are sugarholics, aren't we? 34:42So, in fact, the fat migrated with the sugar. 34:44So, here's, this is from Keys's own work. 34:48Page 262, if you wanna pick up the 500 page volume. 34:53one paragraph that talks about this. 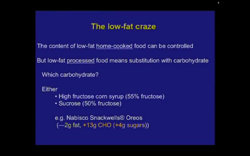 35:04the intercorrelation of sucrose with saturated fat. 35:13Where ever there was the fat, there was sucrose too. 35:16Because these guys here eat donuts. 35:34you have to do it both ways. 35:44and who that fat still works. 35:48He didn't do it, he didn't do it. 35:55to do a multivariate linear regression analysis. 35:57Now, this was done before computers. 36:00We can't check the work. 36:02He's dead, he died in 2004. 36:05So, we're left with a conundrum. 36:17and policy in this country on this study. 36:29all right, you got it? 36:31Everybody, am I debunking, yes, no? 36:37Remember, I told you LDL may be not so bad? 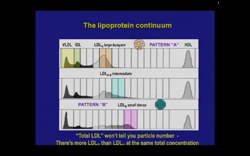 36:41Because there really isn't one LDL, there are two. 36:49pattern A or large buoyant LDL. 36:55with cardiovascular disease, and that's true. 36:57I'm not gonna argue that, that is true. 36:59But, it's not this one, pattern A LDL. 37:03These guys are so light, they are buoyant, they float. 37:18to start the plaque formation process. 37:22called pattern B or small dense LDL. 37:35and they start the plaque formation. 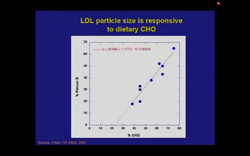 37:39the dense LDL is the bad guy. 37:48because it's too hard to distinguish the two. 37:51So, when you get an LDL, you're getting both LDLs. 37:55The neutral one and the bad one. 38:01is the neutral one or the bad one. 38:09tell you which one it is. 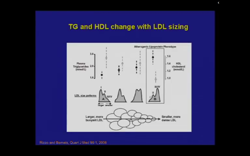 38:13big large buoyant LDLs, and you'll notice 38:17 that the triglycerides are low, and your HDL is high. 38:23 high HDL, 'cause that's the good cholesterol. 38:26 You want high good cholesterol. 38:28 Over here, you have pattern B. 38:29 And here you have high triglyceride, low HDL. 38:32 That's the bad guy, that's the guy you don't wanna be. 38:34 'Cause you're gonna die of a heart attack. 38:37 No question about it. 38:40 cardiovascular disease way better than LDL ever did. 38:45 Point is, when you measure LDL, you measure both. 38:49 So, dietary fat raises your large buoyant. 38:54 What do you think raises your small dense? 39:02 and here's your pattern B going up. 39:05 So what did we do? 39:07 What did we do in 1982? 39:12 What did we do? 39:16 supposed to be a low fat diet, right? 39:19 So, here's the low fat craze. 39:22 Took America and the world by storm. 39:29 in your house, you can control the content of fat. 39:38 it tastes like cardboard. 39:40 It tastes like (bleep). 39:44 So the food companies knew that, so what'd they do? 39:47 They had to make it palatable? 39:49 palatable that has no fat in it? 39:51 You add the, sugar. 39:54 So, everybody remember Snackwells? 40:01 four of them being sugar, so that it was palatable. 40:06 that's the worst thing you could do. 40:09 And that's what we've done. 40:10 And we're still doing it, today.